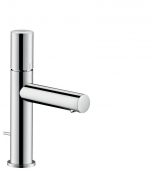 The language of the product line Uno is the absolute purism: in its most distinctive form, UNO reduced to two cylinders joined at right angles, but also less distinctive with simple rounded faucets. In the shower, the faucets are reduced to a tubular optic in effort to pay tribute to the original water transport. The surfaces brass and nickel make this intention particularly effective. 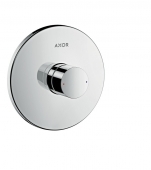 Uno was designed by the Phoenix-Design Group, which has been working for Axor for more than twenty years and has received over 700 design awards. 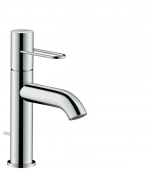 The stand faucets from the product line Uno are particularly puristic. 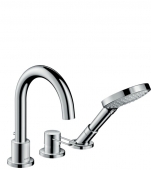 The slender cylindrical water spout meets the equally slender cylindrical body of the faucet at right angles – original and yet modern. 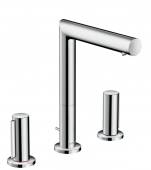 The slightly curved versions of the washbasin faucets are slightly less linear but still puristic. They are available in free-standing and wall-mounted versions. The pulled and Select handles continue the purism all the way through, while the U-shape handles loosen up the design a little without seeming excessive. The highlight of the line is certainly the floor-standing washbasin faucet, which has a strong presence despite all simplicity. 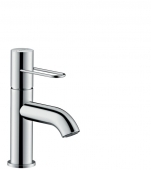 The Select function or the electronic control for some faucets also characterizes the operation of purism and simplicity. 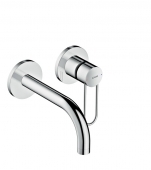 In addition to the single-hole version, the Uno product line also includes two and three-handle faucets. 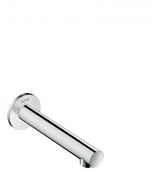 The Showerpipe 800 is an ideal complement to the simple faucets from Uno line. With its simple, rectangular shape, it perfectly reflects Uno's principles and shows the original way of transporting water through pipes. Especially in the surface of brass, this originality comes into its own. 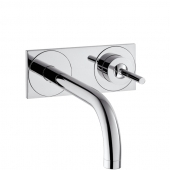 Uno also offers several single-lever mixers with different types of handles and also shower sets with shower rail and hand shower. Shower hose impresses with clear lines and simple design. 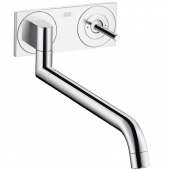 Uno also offers various versions of a free-standing mixer faucet in a puristic rectangular design for bathtub - with and without hand shower, as well as with and without operating lever. 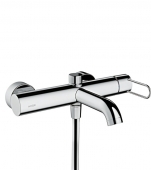 The tub faucets with operating lever are slightly less reduced. Like with the washbasin faucets, the product line also offers a one-piece curved floor standing bath spout. However, this is only available without hand shower. 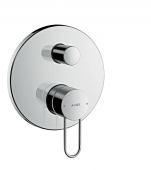 The bath faucets are optionally equipped with a U-shape handle, the Select button or the Zero handle. With the three- or four-hole faucet for the bath rim and the curved bath inlets, the puristic forms are loosened up and appear a little more elegant. The puristic design of Uno can also be continued in the kitchen: with the single-lever kitchen mixer. It also shows straight-lined and right-angled forms but has a round body and rounded corners. 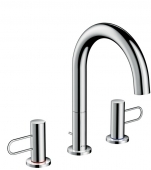 The faucet can be swiveled in three stages (110°, 150° and 360°) and thus enables flexible working in the kitchen. If you would like to combine the puristic bathroom faucets with matching accessories, you will also find them in the range of Uno. 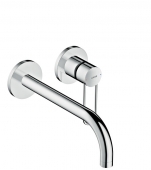 Towel rails, soap dispensers, glass shelves, wall lamps and much more complete your bathroom furnishings stylishly.